But I'm feeling much better now, and I've got a lot to show you! I'm still on track with the challenge when it comes to painting... so you'll be getting two posts today and tomorrow. Then, I'll be all caught up! For my VIOLET nails... 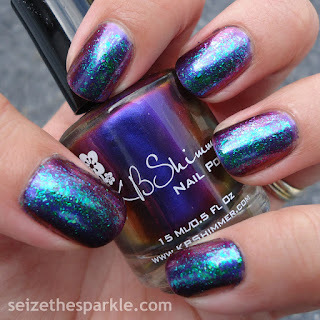 I chose another polish from my recent KBShimmer purchase... Pigment Of My Imagination. I was seriously debating using it for my Blue Nails, but decided it fell more into the violet category. It's a gorgeous multichrome that flashes violet, fuchsia, red, orange, and yellow. 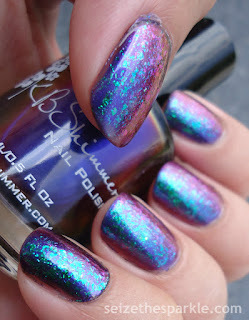 The main color shift visible on the nail is from violet to a shade in-between fuchsia and red. On its own, Pigment Of My Imagination would've been enough to satisfy the prompt. But I couldn't stop there! I just had to see what ultrachrome flakies would look like when layered over an multichrome polish. The result? Ultra-awesome! 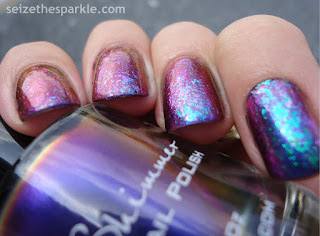 The metallic flakies in Look On The Nightside flash from green to purple, so there was a lot of shifting going on! The color of this mani changed with every single movement of my hands. I was really sad when I had to take this polish off. I could easily have worn it for a couple more days! I can definitely see adding some more multichrome and ultrachrome flakies to the stash. There are sooooo many potential layering combinations that would just look ah-mazing! Definitely a new fave!!! #31DC2015 015 // Delicate "Print"